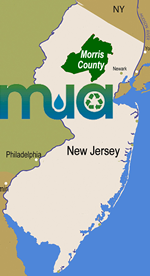 Two Grant Opportunity for Public Schools in Morris County (grades 5-12) sponsored by the MCMUA and Morris County Clean Communities. 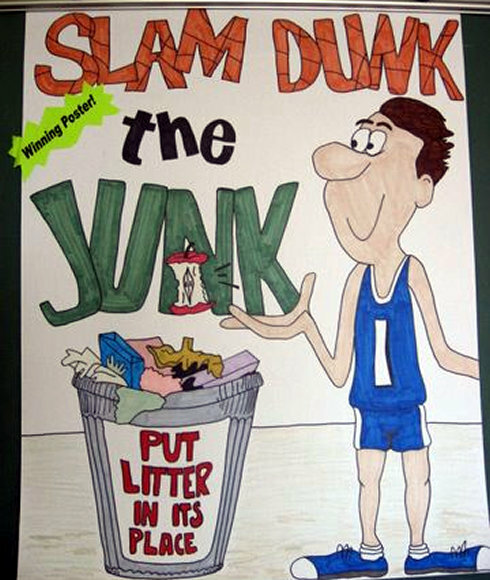 Schools can apply for grants for litter cleanups or poster contests or a combination of both. Click here for a PDF copy of the grant application packet for the combination of litter cleanups and poster contest. Click here for a PDF copy of the grant application packet for the litter cleanups only. Click here for a PDF copy of the grant application packet for the poster contest only. The deadline for submitting an application is April 10, 2019. 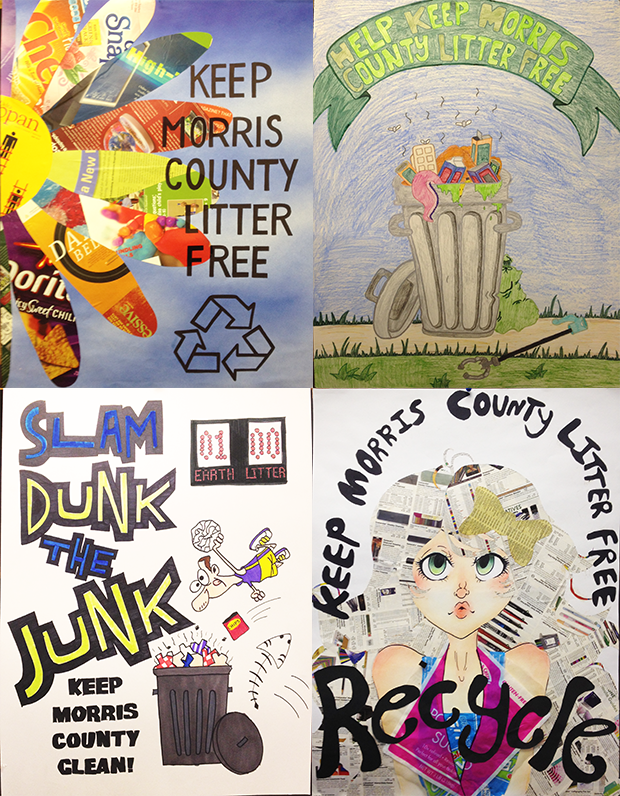 According to Liz Sweedy, Morris County Clean Communities coordinator, "Keep Morris County Litter Free" is part of the "Slam Dunk the Junk" statewide initiative sponsored by the New Jersey Clean Communities Council, which focuses on conducting litter cleanups, enforcing anti-litter regulations and changing the attitudes of "litterbugs" through education. To quality for a grant, a public school must conduct a litter cleanup on at least two acres of school grounds, which may include ball fields and wooded areas, between April 10 and June 6, 2019. A minimum of 20 students and their adult supervisors much participate in each cleanup. After the cleanup has been conducted and the proper paperwork has been received and reviewed by the MCMUA, the school will receive a $500 grant to purchase outdoor receptacles for either recyclables or trash, or indoor receptacles for recyclables only, Sweedy said. During litter-free efforts last year, 1,353 students and adult supervisors from 23 schools cleaned 212 acres of land and collected 159 bags of trash, 121 bags of recyclables, 2 tires, 167 lbs. of scrap metal, according to Sweedy. 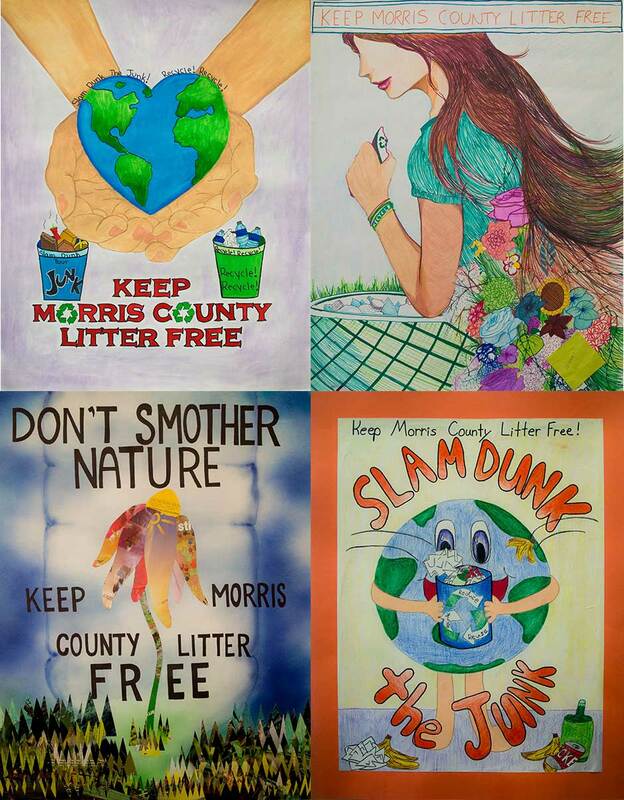 A second and optional component of the grant program is a school-run poster contest for Morris County public school students in grades 5-12. 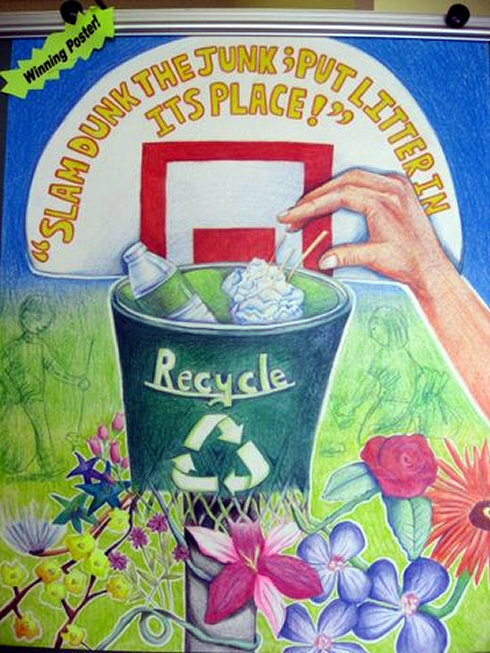 County winners of this contest will receive a $200 gift certificate and have their posters replicated on a recycling receptacle for their schools. 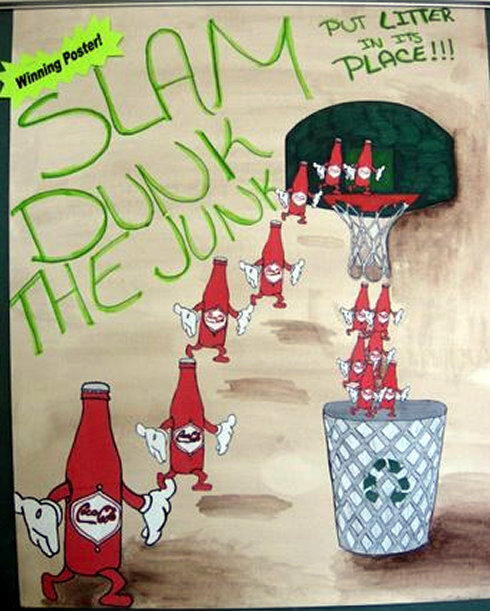 A school may participate exclusively in the poster contest or in conjunction with the cleanup, but it must conduct a litter cleanup to earn the $500. 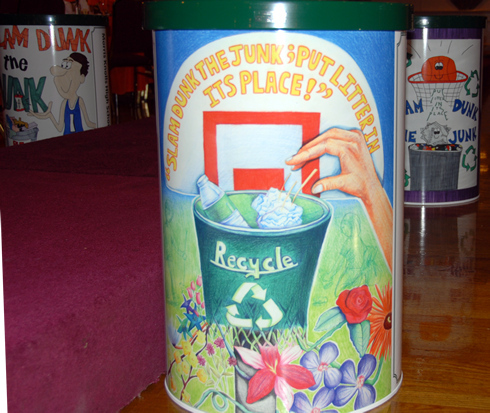 "We are confident these two 'green' projects will raise awareness about both litter abatement and recycling, and at the same time will assist the participating schools financially," Sweedy said. 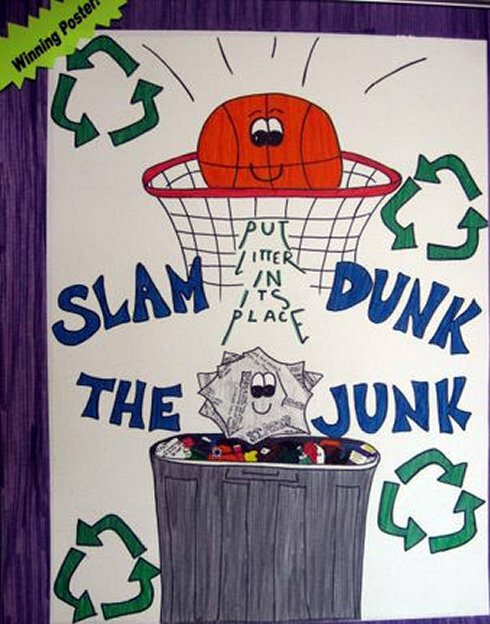 Click the links to download application packets for the slam dunk the junk litter clean up grant, poster contect grant or a combination of grants for both the litter clean ups and the poster contest. The applications must be received by April 10, 2019. Additional information may be obtained by calling Sweedy at 973-285-8393. Below is a sample of what winning posters look like when replicated on a recycling receptacles at the MCMUA's recycling awards dinner.